Try adding apples or jicama. You can use dried cranberries instead of raisins. This salad can be prepared the day before and stored in the refrigerator. 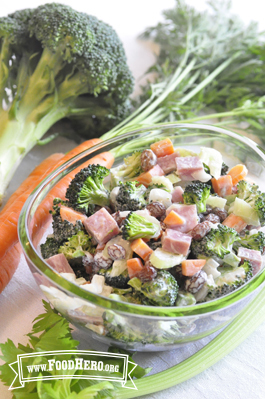 In a large bowl mix together broccoli, carrot, celery, raisins, onion and meat. Mix together mayonnaise, yogurt, sugar and vinegar in a separate bowl. Add mayonnaise mixture to salad and mix well. 5 Comments for "Broccoli and Everything Salad"
This was a real hit with a group of 3rd and 4th graders. Only 25 out of a group of 126 didn't like it yet, and most not only liked it, they loved it! This salad is one of my favorites; I even eat it for breakfast at times:) I always use broccoli as the base, but you can substitute almost any raw vegetables that you like for the carrots and celery. I have also added cooked kamut or wheat berries to the salad and enjoyed that as well. Yum! Another great Food Hero salad! We substituted peas for the meat. And we made extras for the next nights dinner so we didn't dress all of the salad the first night. Also this salad was the perfect side dish to go with the Food Hero Cheesy Polenta Pie! This salad is fabulous! Even people who don't like raw brocooli love it! I make it all the time! Salad had a nice mix of savory and sweet.